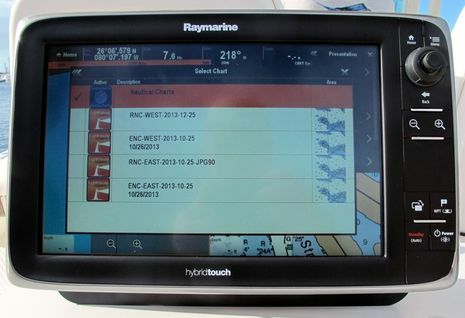 Raymarine’s new chart software engine can also display NOAA’s vector charts — known as ENC’s (electronic navigation charts) as opposed to the paper-like RNCs — but first Ray has to convert them all into its new LightHouse chart format. This intermediary step means that Raymarine probably won’t issue updates as frequently as NOAA does, though I’m told that quarterly or even monthly updates are being considered. While users will need a fast internet connection and a large SD card to get the updates to their Ray a-, c-, e- or gS Series displays, most already do (I suspect). 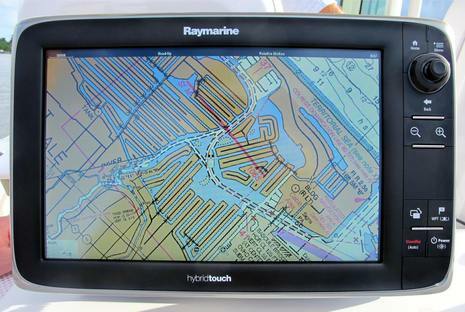 Having its own chart formats and distribution system means that Raymarine can conceivably offer other free charts for countries where they’re available — like New Zealand and Brazil — or even sell cartography from other sources like Furuno does via its MapMedia partner and Navico does at its Insight Store. 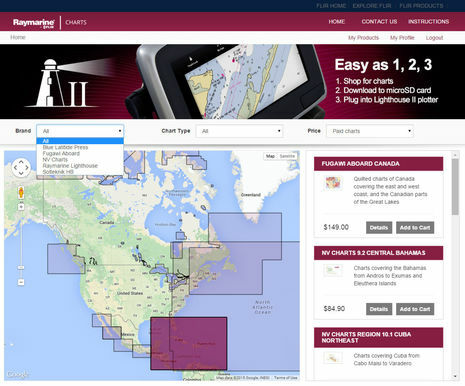 Their long relationship with Navionics is not over, though; LightHouse II will also support all Navionics chart cards and can purportedly display them in new ways. 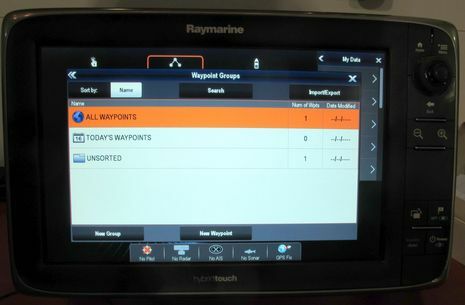 So, while this a significant strategic change for Raymarine, I think that the first impression for the U.S. owners of their current hardware will be something like, “Holy cow, after December I’ll be able to download, update, and use two official chart types – all for free!” Some shoppers are going to perk up at this news too, especially as Ray may lower some U.S. MFD prices, since they will no longer have to pay a Navionics fee for embedded charts. And while there are some boaters who don’t give a hoot about paper-like raster charts, there are a lot of us who do. Vector charts may be “smart” — you can turn data layers off for simplicity, highlight important depths, etc. — but the display is assembled by software, not the human cartographer who actually draws a paper/raster chart and thus can put extra emphasis on perceived dangers. With Raymarine joining Furuno and the various plotters that support C-Map 4D with its NOAA raster layer, not to mention the Navico-compatible NV-Charts and all the PC/tablet apps that support raster, the “paper chart” format appears very much alive and well. Did you notice how the first two screens are all chart? That’s because LightHouse II let’s you auto-hide the data bar that’s always occupied the top section of LightHouse screens. Just touch the screen or hit a button and it appears again. As a navigator who often splits these wide screens into two head-up radar or chart windows, this is a much appreciated change. 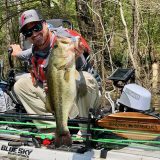 It will free up pixels for better fishfinder display, which is further improved because the new software can support multiple Ray fishfinding devices. 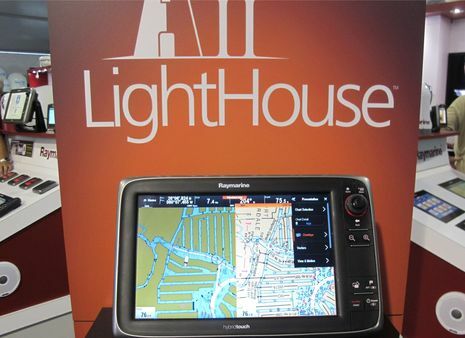 It’s also nice that Raymarine is switching its waypoints, routes and tracks to the standard GPX format, which will be much more easily shared, and apparently, LightHouse II also makes waypoint and route management much easier. In fact, as the photo below suggests, the whole menu structure has been rethought and graphically polished. I look forward to when all Ray a-, c-, e- and gS Series owners can try LightHouse II, but what do you think so far? Some people think that only old folks like digital raster charts, and who am I to argue? (Heck, I turned 67 today!) But isn’t there more value to the hand-drawn chart than just the fact that many of us used them when we first went boating? Raster or vector, choice is good. In fact, the ONLY chart I’ve found so far that properly portrays the channel and entrance marks at Emeryville, CA (my home port) is the NOAA raster chart. All of the others have the marks offset (though the channel is properly depicted, which looks odd). I really should send Navionics a note about it, I guess. Are the i70 displays affected by the new menu system? I don’t know, Dan, but isn’t the i70 menu system already quite different than what’s on the MFD’s? What has happened in recent LightHouse updates is that some of the fancy i70 instrument screens can now be called up on the MFD’s, and I was told that one major reason for the new databar auto-hide feature is that some people are using the a65 primarily as an instrument display. 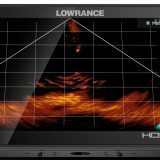 It wouldn’t make sense on some boats because of the extra power and ethernet cables, but for not much more money you get a 1.7-inch bigger screen and a backup full-featured MFD that can even handle IP video. I don’t have a recent MFD (E-80 still going strong) to compare too. The i70 menu system is described in the manual as having the lighthouse user interface, as does the Ray website which reads “New LightHouse user interface is simple and quick to use”. Wouldn’t it be great if the new Lighthouse II also utilized ActiveCaptain for crowd sourcing data. A real win for everyone! Hartley, what do you mean by “offset”? 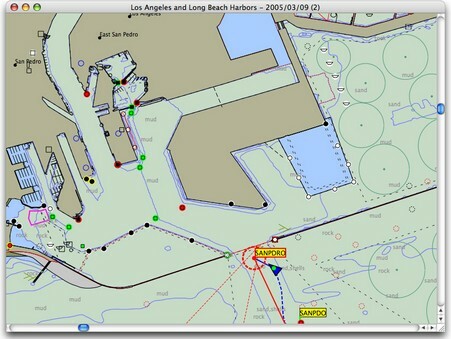 Emeryville is also our home port and both of our plotters seem to accurately depict the channel. One chart is Jeppesen C-MAP on Furuno NN3D and the other is ENC on Rose Point. I’d be curious to see how ours differ from yours. As an aside, for us raster charts are totally useless for anything except getting an overview of an intended route. The fact that the labels and soundings don’t rotate when you are not viewing the chart north up (or heading north) adds dramatically to the cognitive load of figuring out what the plotter display is telling you while underway. 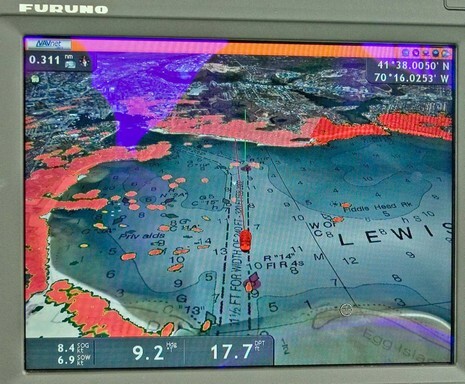 Adam, I am using Navionics Silver, and all three sets of marks are displaced significantly East and slightly South of their actual location. The outer pair is the furthest off, the last two that mark the turn are only off a little. I initially thought it might have been an issue with them being private aids, but when I looked at the NOAA raster charts (using RayMarine’s Voyage Planner program), they were depicted in the correct place. Every other significant point I’ve passed has been pretty much where it was supposed to be (the end of the Berkeley Pier, for example) so this may be just an isolated flaw. This is certainly a step in the right direction. 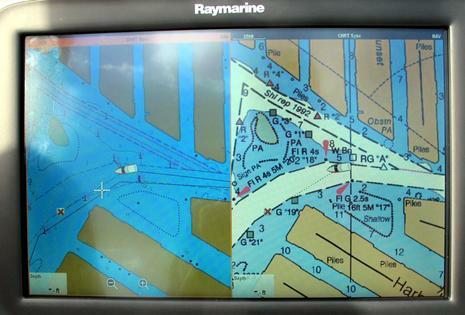 No longer will Raymarine customers be saddled with overpriced and underfeatured proprietary “charts”, Of course, iPad users have had access to free NOAA charts for years. Difficulty in locating zoom dependent navaids in Nantucket Sound and Vineyard Sound has turned me to a fan of raster. Also happy to see Ray going to GPX format. High time the industry move to a single, portable format for waypt, route, track data. Hartley, these are the NOAA raster and vector charts discussed in the entry, just reformatted to display well on Ray a,c,e and gS-Series MFDs. Hi Ben, Yep – already downloaded a bunch of ’em (lotsa gigs, took a couple hours). I won’t be back on the boat for another month or so to try the update and charts out, unfortunately. I just finished a trip to La Paz to visit our boat. One of my projects was to upgrade my e125 and e165 to the new Lighthouse II. The upgrade went off without a hitch and the raster charts are cool. Am I the only customers that thinks this is a big deal? Really great to see you pop up on Panbo again, Jeremy! 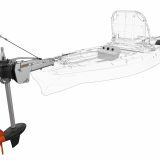 I don’t think that you’re the only boater with this issue, but I fear it’s also a scary deal for the manufacturers. To my knowledge only Furuno lets their TZT Touch work with their viewing and control apps through a boat’s WiFi router. Navico does publish guidelines for how to set up your own router to work with their GoFree but they look complicated and I think they position the guidelines as only appropriate for people with deep IT experience. In other words, I think, please don’t call tech support about this. Meanwhile Maretron changed their whole N2KView architecture to protect it from boat router issues, and protect themselves from having to solve problems they didn’t create. In short, this is a tricky area. But on a jollier note, I’m hearing about some exciting new ways Raymarine and Navionics are going to use WiFi, and I’ll be at the press conference next Thursday. What I think Raymarine should offer is the option to use an existing ssid–with all the appropriate warnings. Jeremy, I agree, it catches me out all the time. I forget I’m on Raymarine Wifi then I go to try to get an email and I can’t until I switch off Wifi and use 3G (or if docked, another Wifi network). What might be nice is some kind of prompt when exiting Ray Control that would ask you if you wanted to switch networks and make it easier to do so. It could take you to wifi settings, or switch wifi off (to activate 3G) at the very least. Good news on Raymarine WiFi. Both the MFD product manager and new General Manager want to support onboard routers. They brought it up, but no timeline. When the Fusion 700 is connected to the e165 via ethernet, you should be able to use the Fusion-Link app on your tablet while connected to the e165’s Wi-Fi network. 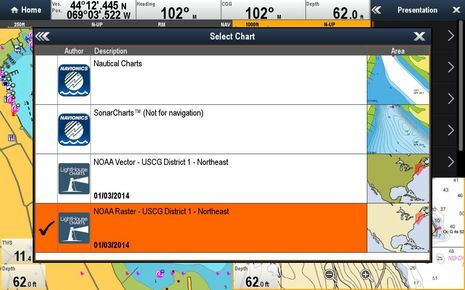 With nv Charts already available, Navico users have two choices for U.S. rasters, though neither is free.